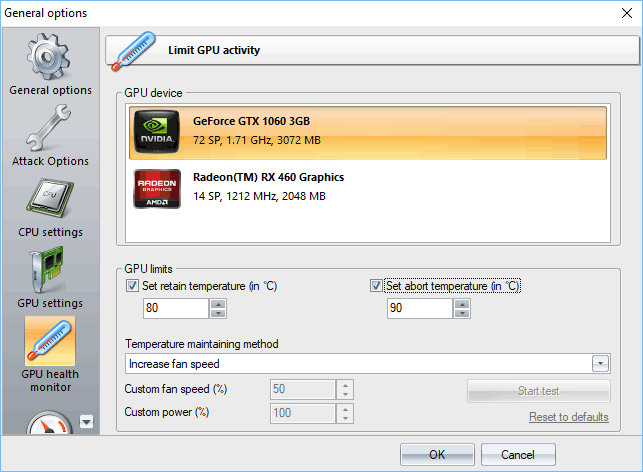 You can use the GPU health monitor to retain a GPU temperature at a certain value, as well as to abort password search in case the temperature reaches a certain critical value. Simultaneously increase fan speed and decrease GPU power. Use it if you want to reduce the fan noise, but a slight decrease in the performance is not a problem for you. Increase fan speed. When this method is selected, the program increases fan speed when the temperature exceeds the limit and decreases when it is cooling down. Use it when you need maximal performance. It is also recommended to set up the abort temperature to avoid GPU overheating. Decrease GPU power. It is quite effective to cool down a GPU temperature. The GPU processor frequency automatically adjusts to the retaining temperature while the fan speed will be determined by your system settings. The disadvantage includes a significant performance drop down in certain cases. Custom settings include user-defined fan speed and/or GPU power. Use the abort temperature to stop searching for passwords once the GPU temperature reaches the limit. Warning! Once an AMD device is selected, the program supports for abort temperature option only. AMD drivers do not allow overriding some values manually for most cards and have numerous bugs that may cause system instability or even BSOD. Consider using the Radeon built-it tool to set up your own performance profile instead.